When it first came out last year, the Sony Alpha a58 was aimed at the middle ground between newcomers to DSLRs and more advanced enthusiasts. It replaced two previous models from Sony, and its healthy selection of features reflected the range of its intended audience. More importantly, more than a year on, the a58 continues to stand out on the basis of its specs, features, and image handling. And it delivers all of this at a compelling, budget price: $450 with an 18-55mm lens. If you aren't already tied to Canon or Nikon--and don't need any of the specific lenses that those systems offer--the Sony Alpha a58 is a great choice. The a58 is solidly built. Its weight and size are about the same as that of the Canon EOS Rebel T5i, but it has two distinct physical traits that I liked: A cutout in the comfortably deep hand grip for my middle finger to rest on and a thumb rest at back, similar to the Nikon D3300. Both of these subtle design elements made the camera easy to grasp. I wouldn't say it was easier to hold, though: Despite being 0.1 of pound lighter than the Canon T5i, the a58 with its lens and battery felt heavier and less balanced to handle than other models I tested. The a58's display articulates, but doesn't have the same range of movement as the T5i's. The a58's 2.7-inch LCD slides down, pivoting flat if pulled out, and it's adjustable on a tilt for overhead shots. While it's not quite as versatile as a full swing-out display like the Canon T5i's, the a58's display does allow for overhead and low-angle shots that you can't achieve with a normal, static display. If you're left-handed, you might appreciate the unusual layout. The camera's 360-degree control dial sits on the top, to the left of the flash unit. This is counter-intuitive for those of us used to cameras typically having such controls to the right of the flash, and depending upon your dexterity, that may inhibit quick settings-changes--it certainly did for me. The dial has clean, self-explanatory graphics that show on the screen as you switch among the options. The usual settings are here: program aperture priority, shutter priority, and manual; plus options for continuous exposure priority, movie, picture effect (which includes toy camera and miniaturization among the 11 choices), sweep panorama, scene mode (for nine presets, including the annoyingly buried macro for close-up shooting). Beneath the clearly labeled dial sits the menu button for accessing a tabbed settings menu. Once again, the menu presentation is clean, and text is clear and simple to read on the high-resolution display. You navigate through the menu options using the four-way rocker to the right of the display, with a center button that doubles as select and auto-focus tracking. The Fn function button above the rocker circle calls up another set of menus, this time for options you're more likely to need quick access to. For example, tap Function to call up 14 options, seven each on the left and right of the screen. This is where you'll adjust scene selection, drive mode, flash mode, auto-focus mode, smile and face detection, auto object framing. Or, tap the rocker to the right to select among ISO (also adjust via a convenient button on the top of the camera), metering mode, creative style, flash compensation, and white balance. While it's important to have access to these settings, it took me a long time to get used to their unusual placement. I prefer it when they're easier to access and fewer menu taps away. It took me some trial and error to get accustomed to the way the horizontal scroll wheel on the front of the hand grip fit in with using the four-way button. Often, I instinctively tried to use the four-way nav when in fact I needed to use the wheel. Another side effect of having so many options: The display gets very cluttered around the perimeter, which can be off-putting to new users and enthusiasts alike. Meanwhile, the top of the camera has some additional buttons worth noting. A red movie button sits conveniently near the viewfinder. A Zoom button, for using digital zoom to supplement the camera's optical zoom, sits on top in prime real estate--images taken at 2X magnification looked soft, but were better than you'd expected from a digital zoom. Also on top is a button for using just the electronic viewfinder or the LCD. The electronic viewfinder and LCD combo make for an interesting pairing. The a58's electronic viewfinder tended to make images a little darker then they were when viewed on the LCD. I wasn't a big fan of that viewfinder--something about the tiny text, the way an electronic sign shimmers due to the EVF's limitations--but it did provide a more accurate representation of exposure than you'd get through an optical viewfinder. The camera is actually smart enough to engage the electronic viewfinder only when you're close to the eyepiece; move away, and the LCD will engage instead. The Alpha a58 has 15 auto-focus points, three of which are cross-point. While that may not sound like it's dramatically more than others (typically, we've seen nine or 11 points), those few extra points make a big difference in compositional possibilities. Unfortunately, changing autofocus options is a pain: You have to first enter the Fn menu, select down to AF area, and then again find the AF option you want. The four-way nav makes it fairly easy to move among the options, but I prefer other approaches. The camera's 20.1-megapixel sensor has a 1.5x focal length conversion factor on the included 18-55mm lens. Images shot at all focal lengths looked great, with sharp, crisp detail and well-balanced color. As with other cameras in this class, ISO to 800 was fairly clean and noise-free. At ISO 1600 you start to see more noise, and by ISO 3200 images exhibited more noise still. What was different, though, is that at ISO 3200, I didn't see as much degradation in sharpness as I've seen elsewhere. Focus speed seemed reasonably fast. So, too, did the five frames per second capture speed, which is competitive for cameras of this price. This speed will work well to capture fast-moving action, though some sports may benefit from more frames per second. This model has a microphone input for shooting video, as well as a dual-microphone on top of the camera. 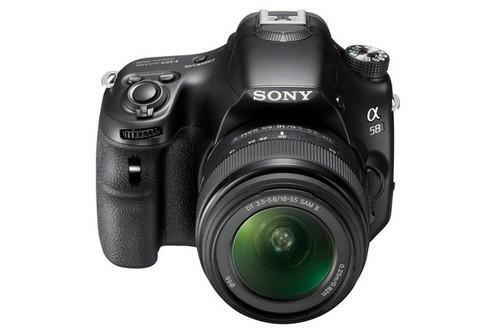 Sony says the camera's battery can last for approximately 700 shots. I found a lot to like in the Sony Alpha a58, which continues to stack up well to its entry-level competition. If you're not wedded to either Canon or Nikon and their lens selection, and don't mind the complexity of deep menus, the a58 is a great value, one that can grow with you as you grow creatively.